Judge Michael Zusman's bialys are topped with roasted onions, poppy seeds and coarse salt. There are two important things that you learn about Michael Zusman, baker and co-author of The Artisan Jewish Deli at Home, when you bake with him. First, his real job has nothing to do with bread or writing recipes: He's a trial judge. "Full time," Zusman says. "Wear a black robe every day." Zusman presides from the bench in Portland, Ore. He handles drug cases, small claims disputes over shoddy car repairs, fights between landlords and tenants, and other daily battles that overload America's legal system. But he had a few days off and visited Washington, D.C. And Zusman made some of the best bialys I've ever had, right in my own kitchen. 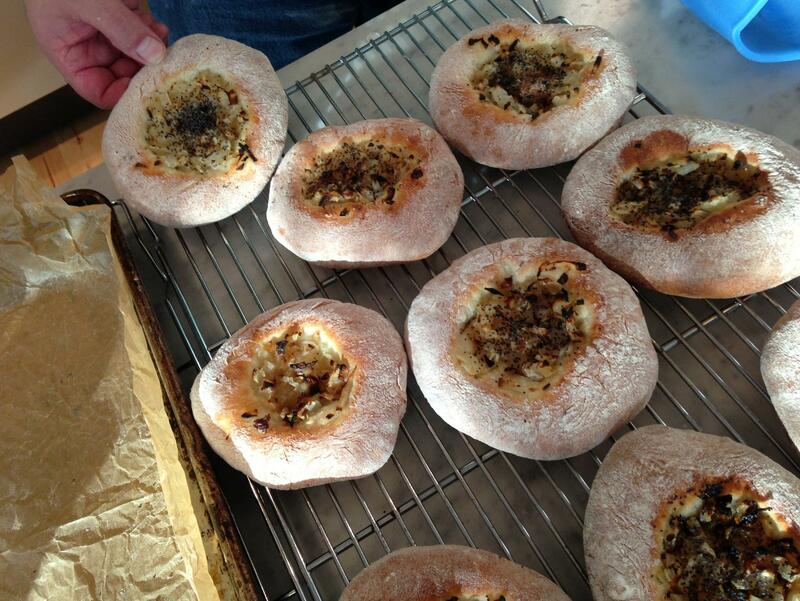 In case you've never had a bialy, it looks like a miniature pizza, topped with roasted onions and poppy seeds. Bagels are far more famous in the annals of Eastern European Jewish cooking, but plenty of people feel passionate about bialys. They got their name as a favorite food in Bialystok, a major city in what's now Poland. Zusman and his co-author promise that if you follow their cookbook's easy recipes, you can make your own bialys and pastrami and pickles — and bagels — better than you can buy at your local deli. And as Zusman baked, and talked, his story reminded me about the redemptive powers of cooking. Because here's the second thing I learned about Zusman: He stumbled into baking. And it helped save him. As Zusman began telling his story, he was weighing out the ingredients for the dough — flour, yeast, sugar and salt. And water. He says whenever you bake, it's better to weigh the ingredients than measure them — a scale is much more accurate. On the other hand, he says, baking's more forgiving than you might think. So don't feel boxed in by the rules. "People feel so intimidated by baking and they shouldn't," Zusman says, turning on the mixer, equipped with a dough hook. "It's not a science experiment. It doesn't need to be quite that precise." But back to Zusman's personal story: He spent more than 20 years working as a lawyer, specializing in suing financial companies. And he says his work literally started making him sick. He had trouble sleeping. His stomach was always churning. He was always leaping into battle. Then one day, he discovered dough. "I had just quit drinking," Zusman says. "I was a pretty heavy drinker and had quit and had lots of time to fill. So, my ex-wife and a friend signed me up for a bread-baking class. Talk about a piece of dumb luck; I just ended up really finding something that I loved." Zusman also discovered that he had, "go figure, an affinity for Jewish breads." When I sound surprised that Zusman graciously credits his ex-wife, he looks more surprised. "She's in the acknowledgments of the book, she did a very good proofread of the introduction," he says, sounding like a proud, well, husband. "We produced this fabulous daughter together and we get along real well. So ..."
He pauses, peers into the mixing bowl and turns off the machine. "I'd say this dough is just the way it should be" — soft and smooth, with just a tiny tug on your fingers like you'd get from a sticky note. In any case, learning how to bake was the first event that changed Zusman's life for the better. "I spent weekends experimenting with different kinds of breads," he says, as he starts chopping the onions. He wouldn't just make a couple of loaves; he'd make a dozen and give them away to friends. Then came the second change, seven years ago: State officials in Oregon made him a trial judge. And Zusman says he loves it. He loves not being the guy who leaps into battle anymore. Instead, he's the guy who brings resolution. "It's an opportunity to exercise compassion, and patience," Zusman says, "things that in my regular life I may not be fabulous at, but I get to practice every single day." And Zusman says one of the most common ways he gets to practice compassion and patience is when people protest their parking tickets. "When people feel they've been unjustly given a parking ticket, the emotions run higher than just about any court I've ever presided over. It's amazing," Zusman says. Especially when the meter expired only a couple minutes before they got the ticket. But, he adds, if you come to court and ask for leniency politely — or even if you write a letter of protest, and it's graciously worded and civil — then he may well slash your fine. "I tend to be sympathetic to citizens," he says. "Yes, it's a technical violation, but it seems really unforgiving for the officers to follow the letter of the law." While I'm watching Zusman cut up the onion, I'm thinking about his life. And I tell him, the more you talk about being a judge, the more you sound like you're talking about baking. Be patient. Follow the rules, except, it's good sometimes to bend them. Be compassionate, and give most of your bread away. Zusman looks at me like I'm nuts. "If those analogies exist, they're purely subconscious," he says. "But it actually makes sense. I'll go with that." Next, Zusman arranges the chopped onions in the shape of a narrow log on a baking sheet, and he slides it into the oven – he roasts the onions until they're gently golden instead of sauteing them, which means no oil splattering on your stove. Meanwhile, the dough is all puffed up, and looking proud and yeasty. Zusman punches it down, and forms little balls. His fingers coax and pull each one into a disk. Then he tops each one with the roasted onions and poppy seeds and coarse salt, and bakes them on top of parchment paper for 20 minutes. And Judge Zusman's bialys are done. Brown, and crusty, and showered with onions and poppy seeds. Like confetti. "Look at this," Zusman says, with his biggest smile all day. "I wish everybody could see this." "These are beautiful," I murmur. Zusman laughs. "If I do say so myself." To make the dough, in the bowl of a stand mixer fitted with the dough hook attachment, place the flour, sugar, yeast, and salt. (Alternatively, if using active dry yeast, stir it into 1/2 cup of the lukewarm water to proof for 15 minutes, or until the water begins to bubble or foam.) Combine for a few seconds with a spoon or by hand. Add most of the 1 cup lukewarm water to the dry ingredients, holding back a tablespoon or two. (Alternatively, if using active dry yeast, add all the water in which the yeast was proofing plus the remaining 1/2 cup lukewarm water to the dry ingredients, holding back a tablespoon or two.) Add the Sourdough Starter. Mix on the lowest speed to incorporate all the ingredients, 1 to 2 minutes. Increase the speed to medium and mix for an additional 8 to 10 minutes, stopping once or twice to scrape down the side of the mixing bowl, if necessary, and to check the consistency of the dough. The finished dough should be soft, smooth, supple and slightly tacky, but not sticky. If the dough is too dry, add the remaining tablespoon or two of water a little at a time until the proper consistency is achieved. Start the mixer on low speed after each addition of water to avoid splashing before returning to medium speed to complete the mixing time. Position the oven racks in the top and bottom thirds of the oven and preheat to 450 degrees Fahrenheit. To make the topping, peel and coarsely chop the onions. Place the chopped onions in a medium bowl. Add the oil. Using a rubber spatula, fold the onions repeatedly until thoroughly coated with oil. Turn the onions out onto a rimmed baking sheet and spread into an even layer. Roast the onions for 10 minutes. Remove the pan from the oven, and using a large, heatproof spatula, gather the onions into a pile in the middle of the pan, turn the onions over, then spread once again into an even layer. Roast for another 10 minutes, or until the onions have softened and some of the pieces have begun to darken. Remove the pan from the oven and transfer the onions to a medium bowl to cool. Once cooled, the onions are ready to use, or cover the bowl and refrigerate. The onions can be kept in the refrigerator, tightly covered, for up to 3 days before using. Increase the oven temperature to 475 degrees Fahrenheit. To make the bialys, once the dough is fully risen, turn it out onto a lightly floured work surface, patting away any excess oil with a paper towel, and roll it out into a 16- to 18-inch log. Cut the dough into 8 equal pieces of approximately 4 ounces each. On an unfloured surface, roll each piece into a ball by using a cupped hand with medium pressure until the dough looks smooth. Flatten each piece into a thick 2- to 3-inch diameter disk. Set aside and cover lightly with plastic wrap. Let the disks rest for 15 to 20 minutes. As the disks of dough are resting, line two rimmed baking sheets with silicone baking mats or parchment paper and set aside. Remove the onions from the refrigerator if the onions were made ahead and chilled. Pour a few teaspoons of poppy seeds into a small bowl or ramekin. In a separate small bowl or ramekin, pour a few teaspoons of kosher salt. Generously flour your work surface. Roll each dough disk in the flour to coat. Using a rolling pin, roll each piece out into an approximately 5-inch disk. Next, use the bottom of a half-cup measure or similar flat-bottomed utensil, like a glass, to press down the center of each disk to discourage the dough from bubbling during baking. Top each of the bialys with 2 rounded tablespoons of the roasted onions, then press down lightly and spread to cover the central portion of the bialy. Sprinkle a generous pinch or two of the poppy seeds on top of the onions, followed by a pinch of the salt. After topping all of the bialys, place them in the oven and bake for about 20 minutes, rotating the baking sheets about halfway through the baking time, if necessary, to ensure even baking. If the onions appear to be darkening too rapidly, lower the oven temperature to 450 degrees Fahrenheit. The rims of the finished bialys should be a medium to dark golden color with any residual flour tempering the color slightly and giving a rustic appearance. Bits of the onions should be darkly colored, but there should still be plenty of soft, uncolored onions as well. With a large, heatproof spatula, transfer the bialys to a cooling rack. Allow to cool for at least 5 minutes before consuming. Bialys do not keep well at room temperature, so they are best eaten immediately or within a day. If left for more than a few hours, toast briefly to refresh the texture. They can also be wrapped well in aluminum foil and frozen for up to 1 month, then thawed as desired. After thawing, toast briefly to refresh the texture. In a large bowl, blend the flours, malt powder and juice with a sturdy whisk. Allow the starter to sit out, uncovered, for 24 hours at about 80 degrees Fahrenheit or 36 hours at about 70 degrees Fahrenheit. The world is full of excellent cooks and bakers who make their living doing something else. Well, today, a story about one of them - Michael Zusman. He's the co-author of a new cookbook, called "The Artisan Jewish Deli at Home, Recipes for Homemade Bagels and Pastrami, Better Than You Can Buy." Zusman makes great bread but as NPR's Daniel Zwerdling learned, the baker's powers go far beyond the kitchen. MICHAEL ZUSMAN: So you've got some lovely Red Star yeast. DANIEL ZWERDLING, BYLINE: There are two important things about Michael Zusman that you learn when you bake with him. First, his real job has nothing to do with bread. He's a judge. ZUSMAN: Full time - wear a black robe every day. ZWERDLING: Does somebody yell, oyez, oyez, as you walk in? ZUSMAN: Not quite. I do get the "all rise." ZWERDLING: Zusman presides in Portland, Ore. He handles drug cases, small claims, fights between landlords and tenants. But he had a few days off, and he stopped by Washington, D.C. And this judge made some of the best bialys I've ever had, right in my own kitchen. ZWERDLING: And here's the second thing I learned about Zusman. He stumbled into baking, and it helped save him. Zusman spent more than 20 years working as a lawyer. He sued companies. And he says his work literally made him sick. He had trouble sleeping. His stomach was always churning. He was always in battle. Then one day, he discovered dough. ZUSMAN: Quite honestly, I had just quit drinking. I was a pretty heavy drinker and had quit, and had lots of time to fill. My ex-wife and a friend signed me up for a bread-baking class. Talk about a piece of dumb luck. I ended up really finding something that I love. ZWERDLING: Now, it seems like the best way to get Zusman to open up is to bake with him. And before we talk any more, he wants to start the bialy dough. ZUSMAN: We have a mixer somewhere close at hand? OK? ZWERDLING: In case you've never had a bialy, it looks kind of like a miniature pizza, topped with roasted onions and poppy seeds. Zusman weighs all the ingredients - flour, water, yeast. ZUSMAN: Fifteen grams of salt. Now, some sugar - 30 grams. ZWERDLING: He says whenever you bake, it's better to weigh the ingredients than measure them. A scale is much more accurate. On the other hand, he says baking is more forgiving than you might think. Don't feel boxed in by the rules. ZUSMAN: It's not a science experiment. It doesn't need to be quite that precise. Oh, I'd say this dough is just the way it should be. ZWERDLING: And he covers the dough. You have to wait patiently a couple hours, to let it rise. So learning how to bake was the first event that changed Zusman's life for the better. He'd spend weekends experimenting with different kinds of breads. And he wouldn't just make a couple loaves. He'd make a dozen, and give them away to friends. Then came the second change. About seven years ago, state officials in Oregon made him a trial court judge. And Zusman says he loves it. ZUSMAN: It fits with who I want to be, and who I think I am. ZWERDLING: He loves not being the guy who leaps into battle anymore. He's the guy who brings resolution. ZUSMAN: It's an opportunity to exercise compassion, patience, things that in my regular life I may not be fabulous at, but I get to practice every single day. ZWERDLING: And Zusman says one of the most common ways he gets to practice is when people protest their parking tickets. Now, listen to this. He says if you protest politely, he'll often slash the fine. ZUSMAN: When people feel they've been unjustly given a parking ticket, the emotions run higher than just about any court I've ever presided over. When I see a couple of minutes over, yes, it's a technical violation. But it seems really unforgiving for the officers to follow the letter of the law. Next step, we're going to roast a couple of onions. ZWERDLING: By the way, Zusman is going to roast them in the oven; no oil splattering on your stove. While I'm watching him cut up the onion, I'm thinking about his life and I tell him, look, I don't want to be too touchy-feely over bialys but the more you talk about being a judge, the more you sound like you're talking about baking. Be patient. Follow the rules except it's good, sometimes, to bend them. Be compassionate. Give most of your bread away. Zusman looks at me like I'm nuts. ZUSMAN: I'm struggling here because I'm just - I just haven't thought deeply about this. ZWERDLING: You don't like my comparisons? ZUSMAN: I mean, I'm not conscious of them. If those analogies exist, they're purely subconscious. But that actually makes sense; I'll go with that. Finally, the dough was all puffed up and looking proud and yeasty. Zusman punches it down and forms little balls. His fingers coax and pull each one into a disk. Then he tops them with the roasted onions and poppy seeds and, of course, salt. ZUSMAN: And the almost final step - well, it is the final step. These are going in the oven. ZWERDLING: And 20 minutes later, the bialys are done - brown and crusty, showered with onions and poppy seeds like confetti. ZUSMAN: I wish everybody could see this. These are beautiful - (Laughter) - if I do say so myself. ZWERDLING: Judge Michael Zusman, he's also co-author - along with Nick Zukin - of "The Artisan Jewish Deli at Home." SIEGEL: And you can get Michael Zusman's recipe for bialys on NPR's food blog, The Salt. Transcript provided by NPR, Copyright NPR.